When a property owner dies in Iowa, title to his or her real property passes by means of the decedent's will, or, in the absence of a will, via the laws of intestate succession established in the probate code, codified at chapter 633 of the Iowa Code. Probate is the court procedure through which a decedent's will is proved and his or her estate is settled. The probate process takes place in the county in which the decedent was domiciled at the time of his or her death. Pursuant to designation in the decedent's will or priority to administer the decedent's estate, as established by Iowa Code 633.227, the court appoints a personal representative (PR) who will oversee the estate's administration. The PR is either called an executor, when named by a decedent's will, or an administrator, in the absence of a will or lack of designation in a will. Regardless, the fiduciary duties of the personal representative remain the same, including marshalling the decedent's assets, paying debts and valid claims on the estate, and distributing the remainder of the estate to beneficiaries. Title to real property that does not transfer outside of the probate process by means of a survivorship interest or trust must pass by means of a deed. Depending on the situation, a PR may be directed by the terms of a will to sell real property, or might need to consolidate the estate by selling property. The PR will need to petition the court for an order of sale if a power of sale is not set forth in a will. 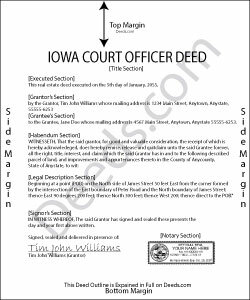 In Iowa, PRs use a court officer deed to transfer property from a decedent's estate to a distributee or purchaser. A court officer's deed must meet all state and local standards, and might also require additional supporting documentation. The completed deed is executed and signed by the PR of the decedent's estate and recorded in the office of the recorder of land records in the county where the subject real property is situated. Iowa requires additional documentation when recording land records, including a Ground Water Hazard Statement (GWHS) and a Declaration of Value (DOV), unless a revenue tax exemption is claimed on the face of the conveyancing document. As always, consult a lawyer with any questions regarding estate administration and court officer deeds in Iowa.